In this video, Angela Huffman shows how she sets up and saves a master panto layout. 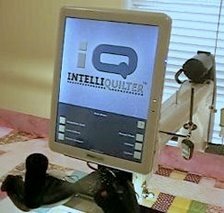 This method can be a great time saver if you stitch a lot of pantos on quilts always at the same size, just as you did with paper pantos before adding iQ. This video was made in 2011 and while the method is still relevant, some of the pages may be slightly different. Click on this link to watch the video on Youtube.